(CNN) -- Wolfsburg coach Felix Magath is to quit the German championship leaders at the end of the season and is set to link up with Bundesliga rivals Schalke. Magath will leave Wolfsburg in June to take his talents to Bundesliga rivals Schalke. The 55-year-old has lifted Wolfsburg from mid-table mediocrity to a three-point lead over defending champions Bayern Munich, but even the lure of Champions League football next season has not proved enough for him to stay at the club. Magath was giving little away about the reasons for his departure in a statement on the club's official Web site. "We have achieved our stated sporting goals much faster than we [had] collectively formulated in the summer of 2007 at my office," he said. "The team is young and will continue to evolve." 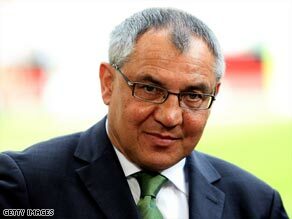 Wolfsburg's supervisory chairman, Hans Dieter Potsch, added: "We thank Mr. Magath for the development initiated in the past two years. "It has taken place within an extraordinarily short space of time." Magath was sacked by Bayern Munich in early 2007 despite leading them to successive Bundesliga titles, joining Wolfsburg, who have never won a major domestic honor. Backed by automotive giant Volkswagen, Magath has used the funds to turn them into title challengers with strikers Grafite and Edin Dzeko starring this season with a combined total of 42 Bundesliga goals. Schalke have been without a coach since Dutch coach Fred Rutten and team manager Andreas Mueller departed earlier this season with their courting of Magath an open secret in the German media. Schalke went into the current campaign with high hopes, but crashed out of the Champions League at the group stage and have never figured in the Bundesliga title race, lying seventh in the table despite a strong recent run of form.